Fred Astaire (1899-1987) was an American dancer and singer famous for his numerous appearances in the 1920s and 1930s in Vaudeville, on Broadway and on the London stage with sister Adele Astaire; in musical films between the 1930s and 1960s; and on American TV in the 1950s and beyond. Although he teamed with many dancers, including Gene Kelly, his best known screen pairing was with Ginger Rogers, with whom he appeared in 10 films. He continued to act in non-dancing roles in films and TV in the 1960s through 1980s. 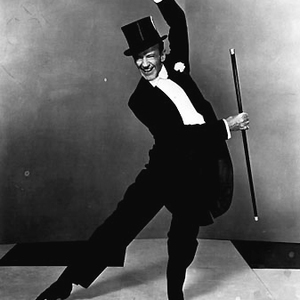 In part because of his expressive phrasing and graceful interpretation, Astaire was chosen to introduce many now-classic songs, including standards by Cole Porter (example, "Night and Day"), his friend Irving Berlin ("Let's Face the Music and Dance"), Jerome Kern ("The Way You Look Tonight"), Johnny Mercer ("One for My Baby") and George and Ira Gershwin ("They Can't Take That Away from Me").